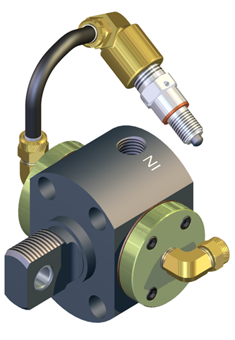 This model incorporates a 4-way Double Bleed Pilot Valve. By means of Built-in Bleeder Valves and internal Cam Bosses. This unit will automatically reciprocate as soon as air pressure is applied. It is recommended that a shut-off valve be mounted in the inlet line. Due to internal construction and application requirements, there can be a loss of approximately 1/4” to 1/2” of stroke. Minimum stroke available is 1”. The following 2 models incorporate a 4-way Manual Valve. 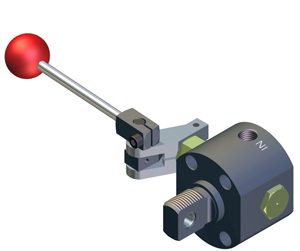 This model requires manual operation of the lever to both extend and retract the piston. This model is lever operated to extend the normally retracted piston. 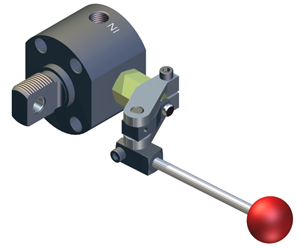 The valve is equipped with a built-in spring return which automatically returns the rod when lever is released.